Auction Terms & Conditions1. Auction Terms. From this point forward in this document Worldwide Diversified Associates LLC. D/B/A Worldwide Diversified Auctions will be recognized or known as WDA.A. All bids on both, live and timed auctions, are binding. Once placed, a bid cannot be retracted.B. The bidder with the highest bid above reserve, if any, shall be deemed the winner of the auction, and be known as the "buyer." Consignor and the agent for WDA retain the right to refuse the buyer's bid at the end of the auction.C. All sales are final. At knockdown, all items become the complete responsibility of the buyer or bidder. It is the responsibility of bidder to insure item from auction. All liability for item becomes bidders responsibility at hammer. D. A 10% buyers premium shall be charged on all online and floor purchases. There will be an additional fee for credit cards if used. (3%) We reserve the right to refuse payment by credit cards at our discretion.E. Any and all applicable sales taxes are the sole responsibility of the buyer. Depending on whether or not the piece is in the state of Florida or another state. Buyers who are exempt from sales tax shall provide WDA a copy of their valid Florida State Sales Tax document that allows them to be excluded from State Sales Tax liability. This document must submitted prior to the auction and before taking possession of their item(s). Tax is 8.5% on items sold in Florida. This includes County taxes. No exceptions!F. All payments must be made in full by bank, certified check or wire transfer by end of next business day of sale. Company or personal checks will only be accepted when accompanied by a current bank letter of credit addressed to Worldwide Diversified Auctions, 'guaranteeing' or 'honoring' payment of that particular check up to a specific amount of money. This will be decided on a case by case basis by WDA. No transfer of property will happen until funds clear and verification of item sold is proven factual. No exceptions. This is done to make sure all parties are protected from fraud.G. Failure to pay for any item purchased or won at auction shall result in forfeiture of all funds deposited by buyer into the WDA escrow account. No exceptions. Average deposit to participate in a specialty action is 10% based on national comparable pricing of similar items.H. Failure to remove purchased items from their location within 10 business days will result in buyer being assessed a $100 per day storage fee.I. Fees for licensing and any additional taxes are to be paid by the winning bidder. No exceptions.2. Dispute ResolutionA. Buyer shall have 48 hours from close of auction to verify the condition of any item or lot buyer has won. Verification must be through a certified inspector based on type of item. This cost is paid by buyer only. Any and all information resulting from this inspection shall be shared with WDA.B. All disputes over actual vs. advertised condition must be documented.C. Any claims or disputes raised by the buyer shall be mediated by WDA, which shall have the final judgement and/or dissension. Proper due diligence is the responsibility of buyer. (We recommend using "WWW.WEGOLOOK.COM". ) No exceptions.3. IndemnificationA. Vendors supply WDA with images and descriptions of each item they place at auction through the company. WDA shall not be responsible for any mistakes, omissions or misrepresentations made by vendors, including but not limited to authenticity, genuineness, origin, age, condition or quality of any item WDA sells in auction.B. All representations made by WDA shall be considered lay opinions only, exempt from liability in all cases. No exceptions.C. All items are sold "AS-IS" and "WHERE-IS," with or without any and all faults. No warranties or guarantees will be made, either expressed or implied, by WDA that the property is merchantable or fit for any purpose.4. Terms and conditions apply to any and all bidders or clients of Worldwide Diversified Associates LLC. 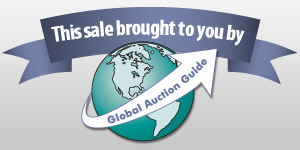 D/B/A Worldwide Diversified Auctions before, during, and after any transaction and/or event. This includes all bidders generated from WorldwideDiversifiedAuctions.com,Hibid.com, or other types of software platforms associated with WDA auctions. This includes all purchases no matter the origination source. This also includes all lots that may be removed from auctions or our inventory or outside sources. ( "AS-IS" "WHERE -IS" NO WARRANTIES OR GUARANTEES APPLIED!) No exceptions.5. Worldwide Diversified Associates LLC. D/B/A Worldwide diversified Auctions reserves the right to change our terms and conditions at any time. Announcement:Information contained herein is presented on behalf of the seller. Worldwide Diversified Associates LLc D/B/A Worldwide Diversified Auctions, agent for the seller, cannot guarantee the information to be correct or assume the liabilities for errors and omissions. All lines drawn on maps are approximate. Buyers should verify the information to their own satisfaction. Any announcements made from the auction block on day of auction will take precedence over any matter of print and will be final.